On August 13, after a mere 13 days of planning, about 1,000 people from 64 community groups marched across the Detroit-Superior Bridge to Public Square, where thousands of more attendees enjoyed music, entertainment, speakers, and exhibitors. And while the rain eventually made its grand entrance that afternoon, it also brought a perfectly timed double-rainbow arching in the sky above downtown. The vision of the “Pride in the CLE” planning committee was carried out by co-chairs Christie Campanile, Daniel Hamilton, and Jacob Nash who worked countless hours in the planning and execution of the event. The trio came together to collaboratively plan an event that would be as inclusive as possible of the full spectrum of identities within the LGBTQ+ communities. 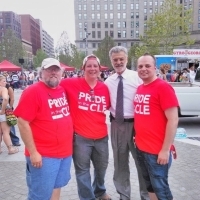 On behalf of all those involved in planning and orchestrating the event, we would like to thank the community for their insistence on having an outlet to celebrate the LGBT community and for supporting the efforts of “Pride in the CLE.” This would not have happened without your proud presence and support—we cannot thank you enough. I'm an editor for a healthcare magazine and would love to contribute more to local papers outside of my work. If there's anyway I can be of help editorially or in production, I'd love to offer my time and experience. I currently work with In Design/In Copy.